There are just some franchises that are so iconic that reinventing them seems taboo. That was the case for one. Until this millennium, Charlie Bucket, Willy Wonka, the Oompa Loompas, and the bratty kids from Roald Dahl's iconic book were synonymous with the classic 1971 film starring Gene Wilder. In 2005, when the new Tim Burton interpretation rocked childhoods and scarred kids with the darker tone that was closer to the book, it seemed as if any new takes on the franchise should never happen. But fret not, a new musical adaptation was born in 2013 in London, and now Charlie and the Chocolate Factory has found a home on Broadway. Filled with sugary sweetness, this musical confection spins a flavor that can only be described as modern. And it's just one of many choices that are bursting with boldness. Like a cautionary tale about what happens if you eat too much candy (and are just a terrible kid), Charlie and the Chocolate Factory follows Willy Wonka as he searches for his replacement chocolatier. Through an international Golden Ticket hunt, five lucky kids get to tour the infamous wacky factory, but only one makes it out unscathed. 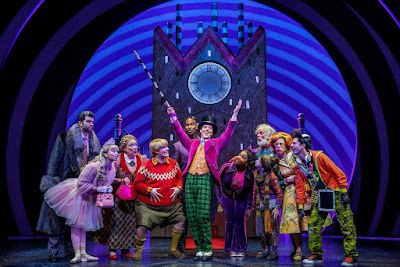 With book by David Greig, music by Marc Shaiman, and lyrics by Scott Wittman and Marc Shaiman, Charlie and the Chocolate Factory is a magical musical where dreams come true, as long as you have a big imagination. There are two ways to look at this production. If you're looking to throw your cares away and just have fun, there's nothing more tantalizing than Charlie and the Chocolate Factory. But if a well-structured, smartly-planned musical is what you seek, this show swings for the fences and strikes out often. Liberties have to be taken. Willy, on his replacement quest, decides to be where the people are and opens up a candy shop in town, where he stumbles on his future apprentice, Charlie Bucket. From there, we watch an hour of exposition before an intermission, and we haven't even seen the thing we desire most: Wonka's Chocolate Factory! And once we get inside, things get dark and twisted. But that's Roald Dahl's story. The audience is completely onboard with the familiarity that the writing team infuses into the theatrical treat. Starting off the show with "Candy Man," leading a little later to “I’ve Got a Golden Ticket,” and then onto “The Oompa Loompa Song,” an overwhelming sense of nostalgia fills the smiling audience. The new music from Wittman and Shaiman is vibrant, modern, and earworm worthy. Just take the new Oompa Looma song. It will get stuck in your head as easily as "It's a Small World." Take that for what you will. The score, while not novel, is entertaining to say the least. The numbers that reveal the Golden Ticket winners are incredibly campy and deliciously hilarious. Greig's book is filled with jokes for all ages. But the characters rely on our awareness of the source material. They needed be fleshed out more, but there simply isn't enough time before we would hit the three hour mark. What’s interesting about this version of the story is the early insertion of Willy into the narrative, which makes this show Willy’s journey, not necessarily Charlie’s. It becomes prominent by the time we enter the Chocolate Factory, as Willy is steering the ship, while Charlie only gets interjections post-drama. There was a superfluous amount of content, especially in the first act. Did Mrs. Bucket truly need a solo, and if she really did, did "dream dad" have to dance his way on stage? The moral of the story is that the libretto was overstuffed, and it may have needed a blow dart like the one that punctured Violet. Bringing magic to the stage may not always be easy, but if you have the ability to entertain the masses, then that’s all the magic you need. Jack O’Brien directed the musical with flourish and spectacle at the forefront. And spectacle surely covered up the woes. This show was all about the visuals, and treaded the fine line of homage and originality. You may hate to compare and contrast the show against the current Broadway field, but you’d expect Charlie and the Chocolate Factory to capitalize on the magic of evolving theatrical technology. Instead, O’Brien and his creative team asked the audience to tap deeper into their imagination. It’s safe to say that scenic and costume designer Mark Thompson had the most important and most difficult task of all. Thompson controlled the visual aesthetic of the show. You can suspend disbelief and watch the ensemble shuffle on their knees to play the Oompa Loompas. You can appreciate the ridiculousness of the props on the Buckets' “house.” But nothing is more disappointing than the cube that represented the edible world of Willy Wonka. The moment that cube appeared, you waited for magic to happen. For it to expand or come to life or something. In a modern time where we like our things small and compact, this was one instance where more is desired. Despite this, the reimaginings of the Golden Ticket winners through costumes allowed Thompson to put his stamp on the characters. But we should all be glad that he kept Willy Wonka in that infamous purple jacket. That liberty would have gone too far. Charlie and the Chocolate Factory featured a cast that was more than capable and eager to enter a world of pure imagination. Willy Wonka was the central character of this story, and the character was left in the best hands possible. Christian Borle has once again asserted himself as a legend of the Broadway stage. 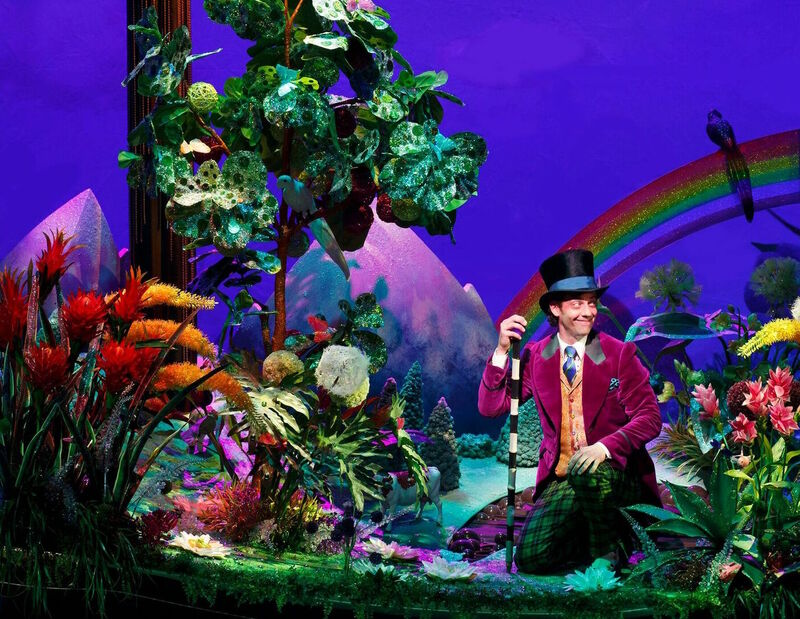 Borle’s natural whimsy and charm allowed him to make Wonka his own. He entices with his smile and offers a lightness, but his ability to turn to the dark side on whim gave his Wonka a tenacious edge. The rotating role of Charlie was played by Ryan Foust. And boy did he hold his own by going toe to toe with Borle and the rest of the veterans on stage. By far, the biggest and boldest move in this production came with the casting of the Golden Ticket winning kids. Rather than casting children, the team chose four twenty-somthings to take on Violet, Augustus, Veruca, and Mike. Standing next to Foust as Charlie, it was jarring. But that eventually all melted away as the quartet’s talent was on full display. Monette McKay (on for Trista Dollison) as Violet brought the soul and the voice. F. Michael Haynie as August nailed the hilarity. Emma Pfaeffle as Veruca was a balletic dream. And Michael Wartella as Mike, looking like a Nickelodeon cartoon character, displayed all the worst traits of kids these days. The adults in this story tend to be outshined by their child counterparts, but when you have Jackie Hoffman, she will inevitably steal the show. As Mrs. Teavee, Hoffman nearly stopped the show every time she opened her mouth with her witty zingers. Was it part of this world? Not always, but when something’s funny, you go with it. 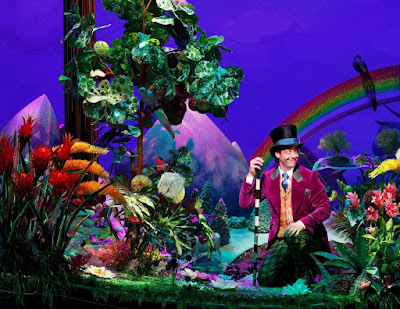 Charlie and the Chocolate Factory is flashy and fun. Watching as an audience member, you’re bound to smile from ear to ear. You wanted it to be scrumptious, but sadly the musical isn’t as satisfying as it should be.